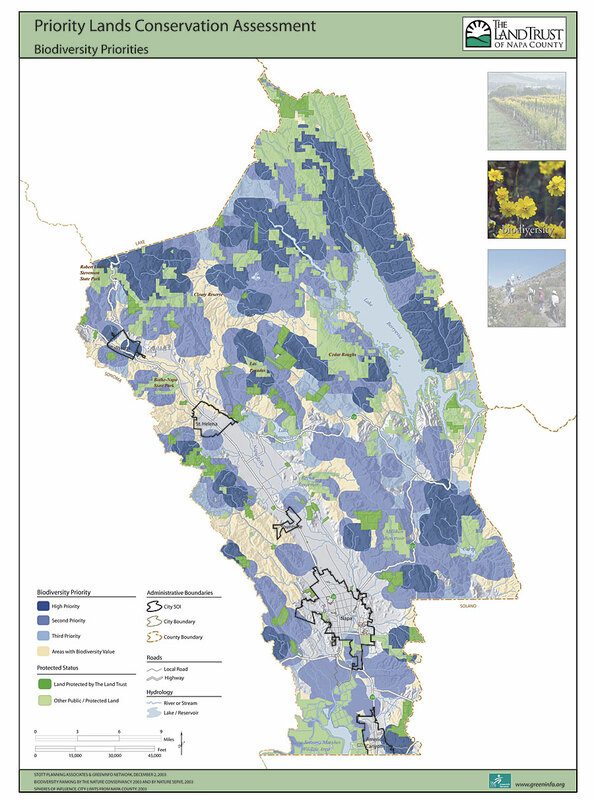 Highest priority lands for biodiversity values in Napa County are shown in darker blues. These are tagged to each property ownership in the county to help the Land Trust of Napa County prioritize its work. Stretching nearly 50 miles north from San Francisco Bay, Napa County, California, is home to some of the finest wine grapes in the world. But the county and its 130,000 residents have a lot more assets than just the fruits of vines and remarkably scenic vistas. Extending into the rugged back country of the 480,000-acre county is habitat that contains almost 70 imperiled species and a number of important natural communitiesone of the highest figures for any county in the United States. Sitting at the north end of the fourth largest metropolitan region in the United States, Napa County faces huge demand to use these lands for different purposes, including expanded vineyards, rural estates, and suburbs. While the county has pursued policies for three decades to maintain its 130,000 acres of agricultural land, only about one-fifth of its land area is securely protected for open space, mostly in a very large and remote holding of the U.S. Bureau of Land Management. For 30 years, the Land Trust of Napa County has been helping the county conserve open space. During this time, it has protected 34,000 acres of land through more than 100 projects�securing voluntary donations of easements (legal tools that limit uses to conservation but leave the property in private ownership) as well as outright acquisitions, some of which are then transferred to public agencies for management. With 1,500 members, more than 100 volunteers, and a small professional staff, the Land Trust of Napa County is a highly effective nonprofit organization. The Land Trust has actively used GIS in almost all elements of its work. Developing display maps, analyzing landscapes to set priorities, and helping with outreach and fund-raising have all evolved over many years in response to needs and the capacity of GIS. Beginning in the late 1990s, the Land Trust adopted ArcView as its GIS and trained one of its staff members in its use. The Land Trust also engaged the nonprofit GreenInfo Network (San Francisco, California) [See GreenInfo NetworkTen Years of Mapping the Public Interest.] to help assemble data, develop basic display maps, and become an ongoing partner in its work. ArcGIS Desktop (ArcView) software was chosen because of its dominance in land management tasks and agencies and Esri's wider support for conservation organizations. One of the first projects this team completed using ArcView was a display poster, showing the land holdings and other protected areas. This poster has continually been updated and improved and is now maintained using ArcGIS Desktop. In 2003, the Land Trust of Napa County took a major step forward with GIS. Working with a planning consultant, Tina Stott, it developed a plan to set key priorities for its future conservation work. It commissioned the Nature Conservancy and its partner, NatureServe (www.natureserve.org), to apply an innovative conservation planning tool, Vista (formerly Project Aldo), to better assess biodiversity. The Vista tool is now an extension to ArcGIS. NatureServe worked with new and highly detailed vegetation data developed by the Institute for California's Environment, University of California, Davis. The Nature Conservancy and NatureServe used ArcView and ArcInfo to identify key landscape linkages that would maintain the composition, structure, and vitality of important ecological systems in the county. Endangered, threatened, or declining terrestrial or aquatic species were also identified as targets for protection. Based on this, protection priorities were set using the conservation values and measures of vulnerability to development. All of this data was correlated to ownership boundaries provided by the county of Napa, allowing the Land Trust to understand not only the ecological character of the landscape but also the nature of each landowner's holdings. GreenInfo Network then worked with the trust's team to apply ArcView and ArcGIS Spatial Analyst to define scenic zones, agricultural areas, and needed recreational lands and to design the maps that would convey this information to the trust's stakeholders and the public. All of this information was published in a special report that set the trust's future direction for the next 10 years. In another effort, in late 2005, the Land Trust applied GIS to a particular opportunity, a large ranch that was up for sale. The GIS team applied the ArcGIS Spatial Analyst extension to analyze other properties that were in the viewshed of the proposed acquisition to help the Land Trust identify other owners who might be approached for donations to support protecting the ranch. The Land Trust of Napa County has an ambitious goal to save an additional 17,000 acres of land by 2010. For more information, contact John Hoffnagle, executive director, Land Trust of Napa County (e-mail: john@napalandtrust.org), or visit the Land Trust of Napa County at www.napalandtrust.org. For more information on Vista, contact Kristin Barker, NatureServe (e-mail: kristin_barker@natureserve.org), or visit www.natureserve.org. For more information about GreenInfo Network, visit www.greeninfo.org.